"He was saying 'Hi, Baby!' I was melting." The Pittsburgh Steelers linebacker, who just finished his rookie season, came to Philadelphia last week to be part of a photo shoot for the anti-animal cruelty campaign Show Your Soft Side - which features athletes and other admirable members of society being adorable with animals. So Matakevich - who loves dogs, and was sure he wanted to adopt at some point - knew there would be very cute, adoptable puppies taking part in the shoot. But he took the train from his parents' house in Connecticut instead of driving, since he didn't plan on taking any of them home. Jerrica fell right asleep. Matakevich fell right in love. "I'm telling you, it was instantaneous," says Show Your Soft Side's founder Sandra Riesett, who was there to witness the magical meeting. "It felt like they set me up," Matakevich tells The Dodo. "I knew right away." 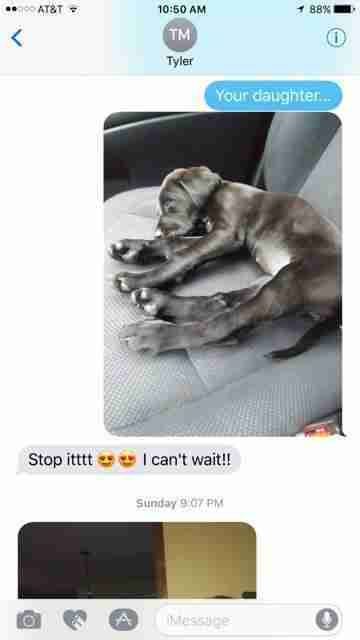 The puppy came from a Delaware-based nonprofit called Renee's Rescues. She's one of an accidental litter, all named for 1980s cartoons; Jerrica was from the TV show "Jem and the Holograms." Renee Martini, the group's founder, says she was very excited to see this love match form. "You have an NFL player who could easily purchase any dog he'd possibly desire. He chose a mixed-breed pup," Martini says. "Talk about a class act! Such a win for the animals." 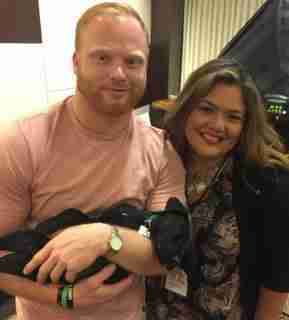 On Sunday, Matakevich's girlfriend, Shannon, drove to Delaware to collect Jerrica. She FaceTimed the actual handover. "He was saying 'Hi, Baby!' I was melting," Martini says. Matakevich says Jerrica's been doing great since coming home to Connecticut. Jerrica - now renamed Bailey - is keeping herself occupied by pestering the family's 13-year-old dog, playing and sleeping a lot, and generally being "a handful," Matakevich says. 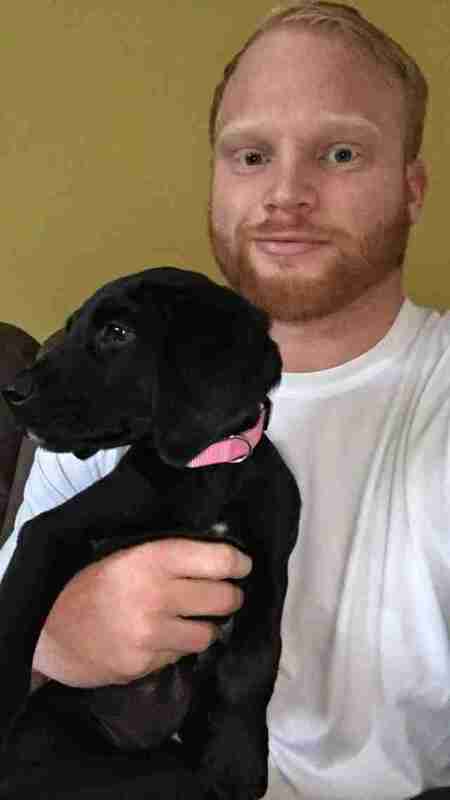 Matakevich brags that Monday night, Bailey sat by the door to let him know she needed to go out - so young, so new and so smart, already becoming housetrained like that. "This is so unexpected," Matakevich says. "It's awesome. She's just such a good dog." You can see more adoptable dogs from Renee's Rescues or donate to their care here.